The country of Panem is divided into the Capitol and 12 districts. In the Capitol everything is opulence and excess, even the landscape is picturesque; meanwhile most districts are poor to the point of starvation and semi-slavery. It is in that context that two youths from each district are chosen annually to compete in The Hunger Games, a display of survival skills in which only one youth is crowned the winner after the other 23 competitors have fought to their deaths. Primrose Everdeen is chosen as the female competitor from District 12, but Katniss, her older sister, volunteers in her place. The other competitor from District 12 is Peeta Mellark, a boy Katniss knows but doesn’t really like. There’s nothing like a good fight to death to force both Katniss and Peeta to form a convenient alliance. I am fascinated with this movie. It is gritty and hints at violence that is shown in bits and pieces, such as teenagers killing each other for the entertainment of the masses, but the story delivers in great, satisfying ways. I haven’t read the source material up to now because I have a big pile of books that I want to finish and I thought that a comparison between book and movie was going to be detrimental to my movie watching experience. However, I came out of the cinema a consummated fan. Where should I start? Jennifer Lawrence is fantastic--as Katniss Everdeen—which I already expected considering her performances in Winter’s Bone and The Beaver. When I watched her in The Beaver I remember thinking “this girl has drama in her veins” and drama she delivers in The Hunger Games big time. Not only Jennifer Lawrence is entertaining, so is Josh Hutcherson as Peeta Mellark, Elizabeth Banks as the colorfully odd Effie Trinket, Stanley Tucci as Caesar Flickerman, who together with Toby Jones, narrates the live games, Lenny Kravitz and Woody Harrelson as Katniss and Peeta’s mentors, and last, but not least, is Donald Sutherland as President Snow, a consummated manipulator and sadist, and Liam Hemsworth as Gale, a role not exploited enough in my opinion, at least not in the first movie. Aside from the performances that as I said are amazing, the camera work is a shaky to the point of dizziness, particularly during the Games, but it conveys the sense of urgency, dynamism and desperation inherent to the Games, thus I found it relevant. I was pleasantly surprised with how mature the movie looks considering it’s the first one in the series, and I suppose The Hunger Games can only grow darker and grittier as the end approaches. This movie is expected to equal or surpass The Twilight Saga and it has been compared to the latter countless times during the promotional period, due to the same targeted audience. However, in my opinion The Hunger Games has a stronger material and the acting, by some already major stars, is definitely better than Twilight. 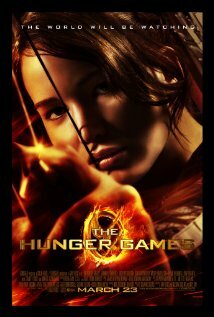 In conclusion, The Hunger Games is entertaining yet gritty, and there’s plenty of action to satisfy all tastes. Not to be missed!